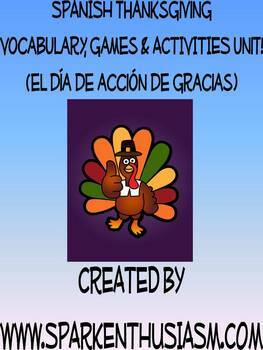 ~ 3 pages of Thanksgiving vocabulary notes en espanol with pictures (both color and black & white versions). 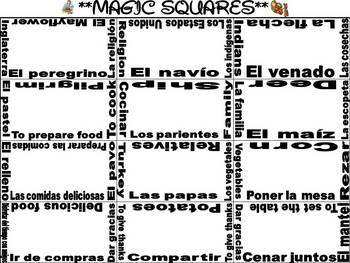 Vocabulary includes los Estados Unidos, el peregrino, Inglaterra, la flecha, el venado, la familia, los parientes, cocinar, las comidas deliciosas, el pavo, el relleno, el pastel, el mantel, cenar, dar gracias, descansar, ir de compras, as well as many more expressions! Please check out the Thanksgiving Power Point and the Thanksgiving Bulletin Board and Flash Cards with Games Unit to complement this Thanksgiving Vocabulary Unit also available at the sparkenthusiasm store on TPT. Spark Enthusiasm Spanish Culture and Holidays! ALL of our movie packets with tons of resources are here! Follow us on Pinterest for excellent ideas and resources! Visit our Spark Enthusiasm Spanish Store for additional high quality ideas and products for your Spanish classes.